David Ha and Jürgen Schmidhuber: https://arxiv.org/abs/1803.10122. 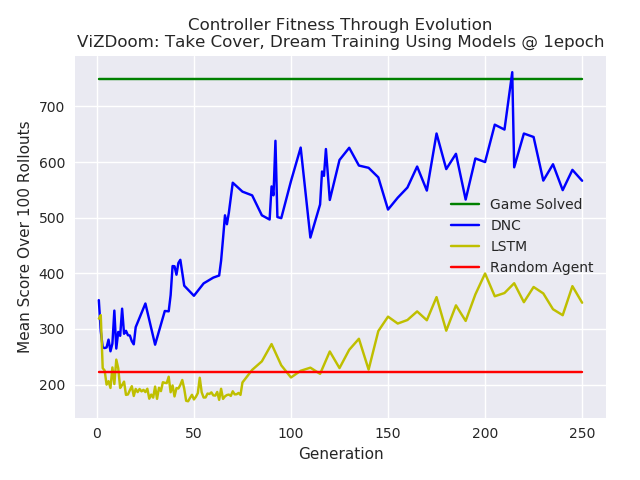 The framework aims to train an AI agent that can perform well in virtual gaming environments. 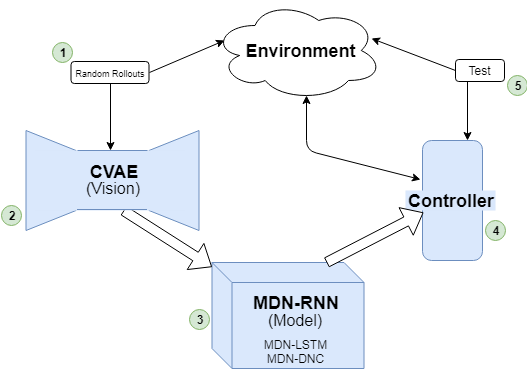 World Models consists of three main components: Vision (V), Model (M), and Controller (C). The full implementation and more details can be found at: https://github.com/AdeelMufti/WorldModels. There are excellent blog posts and guides available on Mixture Density Networks, so I will not try to replicate the effort. This post provides a quick summary, and implementation code in the Chainer deep learning framework. 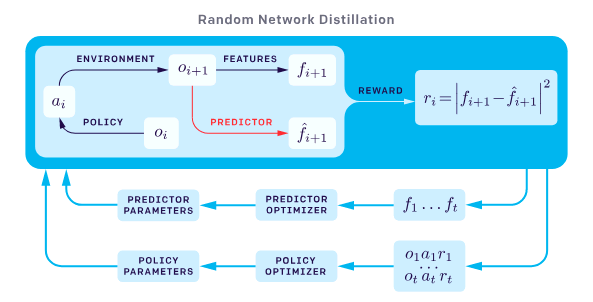 In summary, Mixture Density Networks are Neural Networks that output the parameters of a Mixture Model, such as a Gaussian Mixture Model, instead of the desired output itself. The Mixture Model is then sampled from to get the final output. 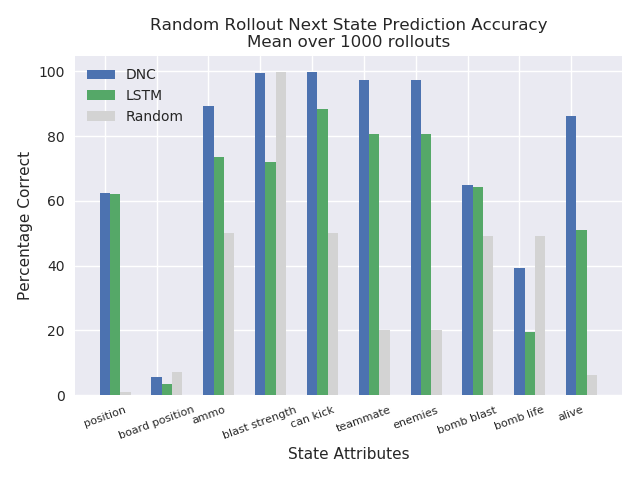 This is particularly useful when given a certain input, there could be multiple outputs based on some probability. 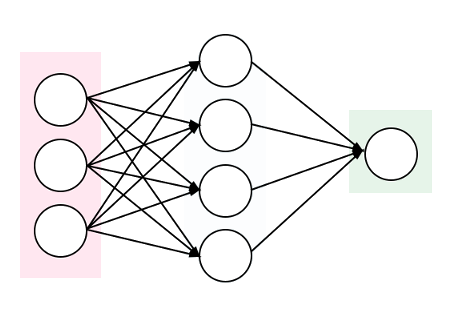 The outputs from the neural network, in the case of Gaussian Mixture Models, include a set of probabilities (coefficients), set of means , and set of standard deviations . For example, if output is y given an x, and you choose to have 3 Gaussian mixtures, the output of your neural network would be: . The sum to 1 and represent the probability of each mixture being the likely candidate, and the and represent the distribution of y within the given mixture and can be used to sample y. Toy dataset of (x, y) coordinates graphed. 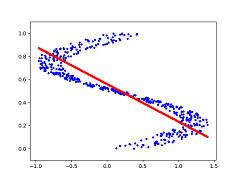 A neural network trained with Mean Squared Error produces an averaged output. 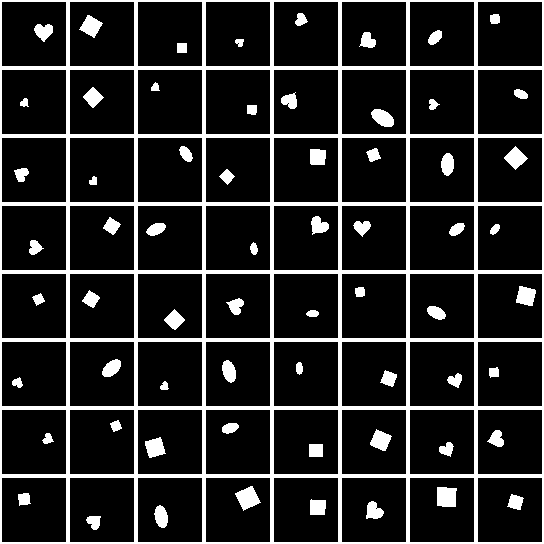 A Mixture Density Network can learn the distribution of the data. 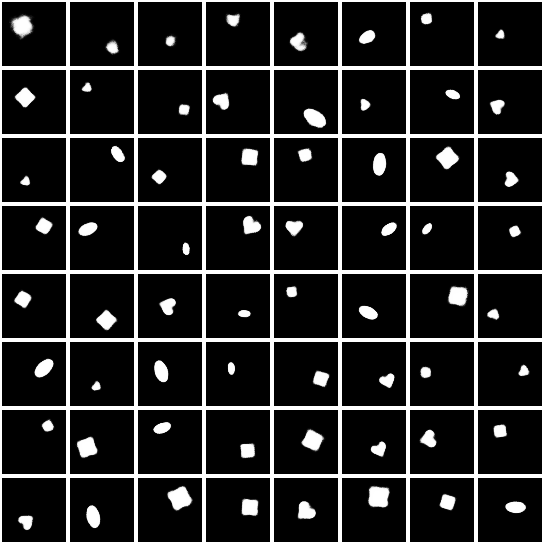 The output of the neural network is simply the number of dimensions in your output (1 in this example), times the number of desired mixtures, times 3 (the coefficient, mean, and standard distribution). In Chainer, a Linear layer can be used to output these numbers. 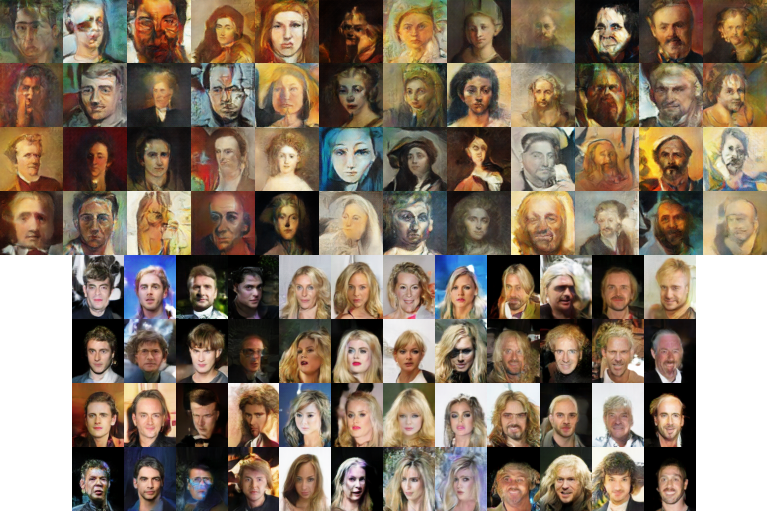 As a 4-month research project for a course at the University of Edinburgh, my group decided to use Generative Adversarial Nets to generate new paintings using the Painter by Numbers dataset. Additionally, we conditioned the paintings, allowing the generation of paintings with certain attributes (such as gender in the case of paintings of portraits). The project turned out to be a big success, and won 2nd place out of 124 other projects in a competition hosted by IBM! 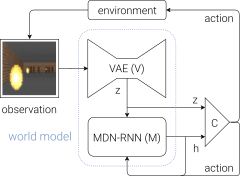 The deep convolutional GAN architecture we chose for the basis of our model enforced a Lipschitz continuity constraint on the spectral norm of the weights for each layer in the discriminator, as proposed by Miyato et al. (2018). This technique, called SN-GAN by the authors, stabilizes the discriminator, allowing the generator to learn the data distribution more optimally. 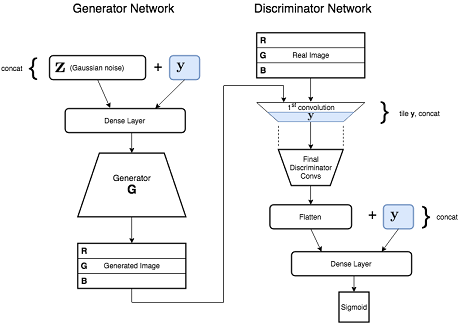 We built upon the SN-GAN architecture to add conditioning, which involved introducing a one-hot encoded y vector of supervised labels to the generator and discriminator. The y vector provides some information about the image, such as gender in the case of portrait paintings, allowing the generator to get conditioned on the label to generate the class of image specified during test time. 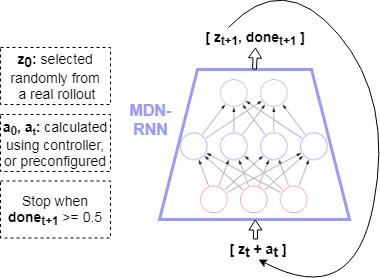 Our contribution was a novel model which we called SN-conditional-GAN or SNcGAN, which is illustrated below. 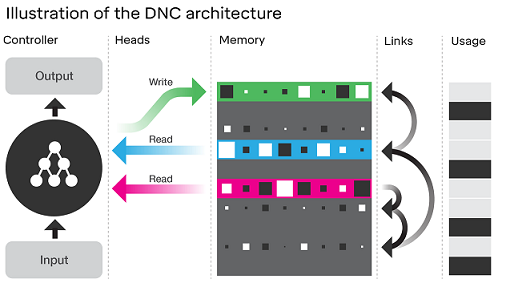 The SNcGAN architecture. The one-hot encoded y label is introduced to the generator and discriminator. More details can be found in our paper linked above. After the publication of the paper, we additionally trained a SNcGAN model on the celebA dataset, allowing the generation of conditioned celebrity images.